Material type: BookPublisher: New York Simmon & Schuster Books for Young Readers 2004Description: 33p. 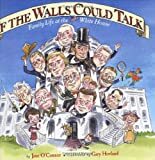 :: col. ill.ISBN: -0-689-86863-4.Subject(s): Presidents - United States - History | Presidents - United States - Biography | White House (Washington, D.C.) - HistorySummary: The walls at 1600 Pennsylvania Avenue have eyes and ears and, what's more, they don't miss a thing. Now, listen up because they have a thing or two to tell you! The walls at 1600 Pennsylvania Avenue have eyes and ears and, what's more, they don't miss a thing. Now, listen up because they have a thing or two to tell you!